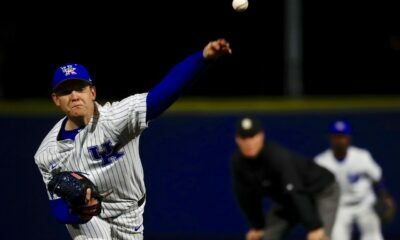 The Kentucky Wildcats got back on the diamond this weekend with a three-game weekend series on the road against the University of Mississippi. Kentucky came into the series with an 18-15 record overall and 2-10 in SEC play. Mississippi came into the matchup with a record of 24-10 and 9-4 in SEC play. Kentucky is ranked last in the SEC East and Ole Miss is ranked first in the SEC West. In the first game, Jimmy Ramsey (2-2) got the start for Kentucky and Will Ethridge (4-2) got the start for Ole Miss. Ole Miss got on the board first in the bottom of the first inning, scoring three runs. C. Zabowski hit a three-run homerun to left field to put the Landsharks up 3-0. Ole Miss added two more runs in the bottom of the fifth, one run in the bottom of the sixth inning, one run in the bottom of the seventh inning, and one run in the bottom of the eighth inning to put Ole Miss up 8-0 going into the ninth inning. The Cats were shut out the first eight innings. In the top of the ninth inning, Jaren Shelby doubled down the left field line, scoring C. Kessler to put the score to 8-1. Cam Hill then reached on a fielder’s choice, scoring Jaren Shelby to put the score to 8-2, which ended up being the final score. Kentucky lost the first game with a score of 8-2. Jimmy Ramsey got the loss for Kentucky to put him to (2-3) on the season and Will Ethridge got the win to put him to (5-2) on the season. This loss put Kentucky to (18-16) on the season and 2-11 in SEC play. Kentucky was led at the plate by C. Kessler going (2-4), Jaren Shelby going (1-3), and M. Gei going (1-4). Kentucky scored two runs, had six hits, committed one error, and left five runners on base in game one. 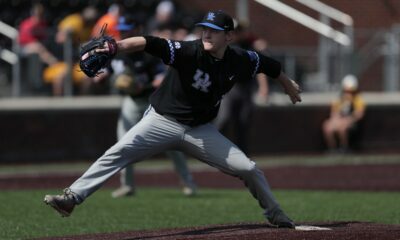 In the second game, Mason Hazelwood got the start for Kentucky and D. Nikhazy got the start for Mississippi. 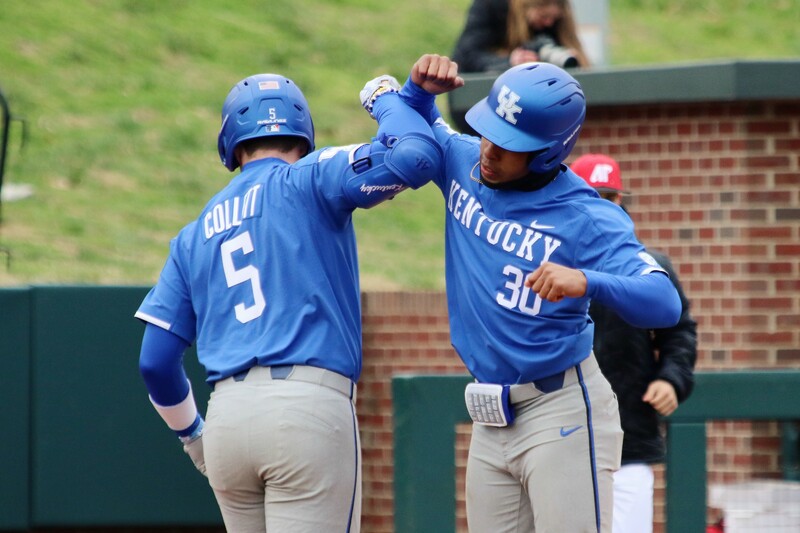 Kentucky got on the board first in the top of the second inning with TJ Collet hitting a solo homerun to center field to put the Cats up 1-0. In the top of the third inning, C. Kessler singled to left enter, scoring Z. Lewis to put the Cats up 2-0. In the top of the fourth inning the Cats added two more runs with Dalton Reed hitting a two-run homerun to left field to put the Wildcats up 4-0. In the bottom of the seventh inning, K. Graham hit a solo homerun to right center to put the score to 4-1. Kentucky won the second game with a final score of 4-1. Mason Hazelwood got the win (2-2) and Carson Coleman picked up his third save of the season for Kentucky. Doug Nikhazy (3-2) got the loss for Ole Miss. This win put Kentucky to (19-16) on the season and 3-11 in SEC play. 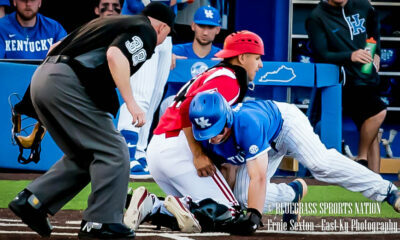 Kentucky scored four runs, had nine hits, committed one error, and left five runners on base. Kentucky was led at the plate by Z. Lewis going (2-3), Dalton Reed going (1-3), C. Kessler going (1-4), TJ Collett going (1-2), Jaren Shelby going (1-3), O. Adams Jr going (1-2). In the final game of the weekend, Zack Thompson (2-0) got the start for Kentucky and Gunnar Hoglund (1-0) got the start for Ole Miss. Kentucky got on the board first in the top of the fourth inning with a three-run homerun from TJ Collet to put the Cats up 3-0. In the top of the fifth inning the Wildcats added another run with A. Schultz hitting a double to left center, scoring Dalton Reed. Ole Miss battled back in the bottom of the fifth inning with G. Kessinger doubling down the left field line, scoring two runs to put the score to 4-2. Kentucky won the final game with a final score of 4-2. Zack Thompson got the win putting him to (3-0) and Daniel Harper got his first save of the season. Gunnar Hoglund got the loss putting him to (1-1) on the season. This win put Kentucky to (20-16) on the season and (4-11) in SEC play. Kentucky scored four runs, had five hits, committed zero errors, and left two runners on base. Kentucky was led at the plate by TJ Collett going (2-3) and A. Shultz going (1-2). 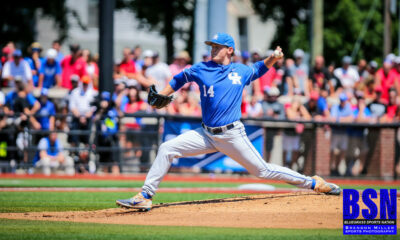 Kentucky gets back on the diamond Tuesday at home against the University of Louisville with a 6:30 PM start time. Weekend Recap: Kentucky picks up two big SEC wins on the road this weekend against a good Ole Miss team. Mason Hazelwood and Zack Thompson both picked up wins. Carson Coleman and Daniel Harper both picked up a save. Jimmy Ramsey was given a loss in the first game. Kentucky is now (20-16) overall on the season and (4-11) in SEC play. Kentucky scored ten runs, had twenty hits, committed two errors, and left twelve runners on base this weekend.